We had sliced Tofurky roast. 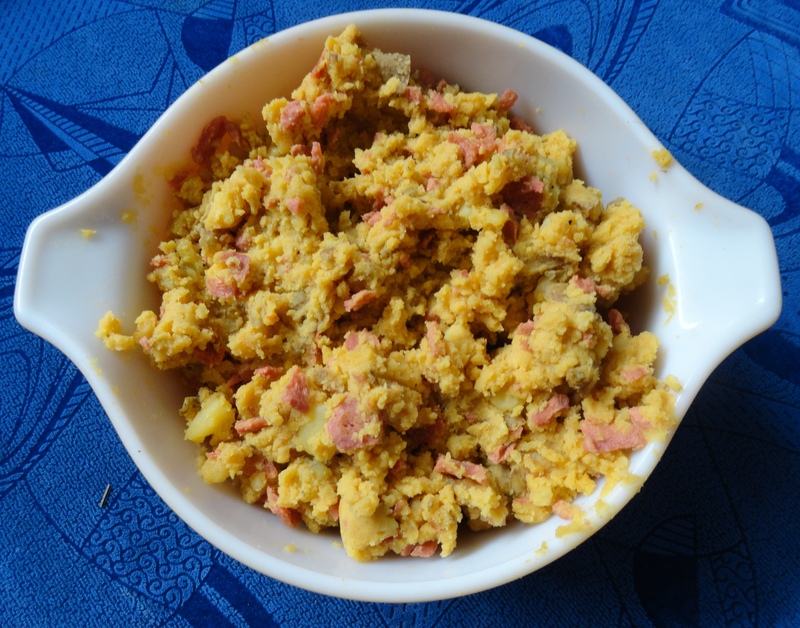 Firehouse cornbread, veganized by using soymilk, margarine, and an Ener-G egg. Campbell’s accidentally vegan mushroom gravy, for the mashed potatoes, and cranberry sauce for the Tofurky. And lastly, a cinnamon pumpkin pie brought by our friend Kyle. Guess whose birthday it is.. it’s America’s! Yay! 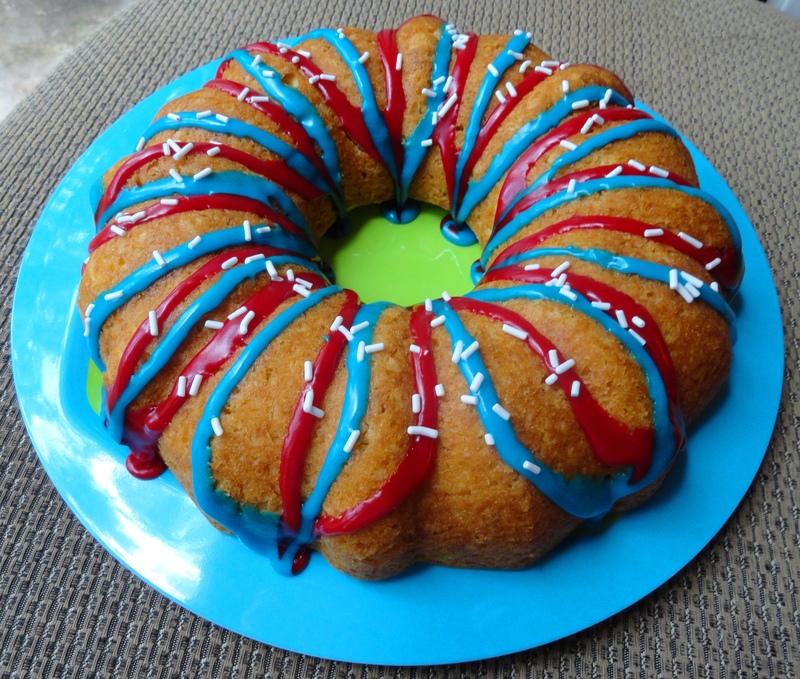 So to indulge in the cheesy “red, white and blue” theme, I made America a birthday cake. Hopefully this will keep us fueled up tonight when we set off fireworks. Yet again, Easter has come and gone, as has my sugar high. I hope everyone had just as good of a day as I did. I know you’re tired of my holiday wishes though, so let’s get on to the candy. Last year I made Easter egg nest cupcakes, and the year before I did the same thing. 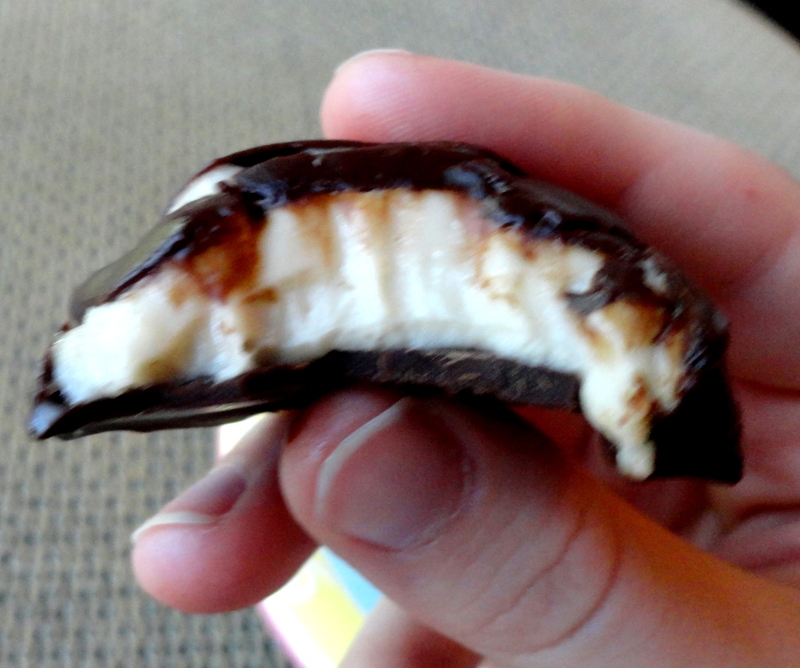 So to change it up, I wanted to try a veganized recipe of Cadbury cream eggs. I was addicted to these as a child, and since they only came out around Easter, that made it an extra special treat. I looked through many recipes and couldn’t find one that I was interested in, so I came up with my own! 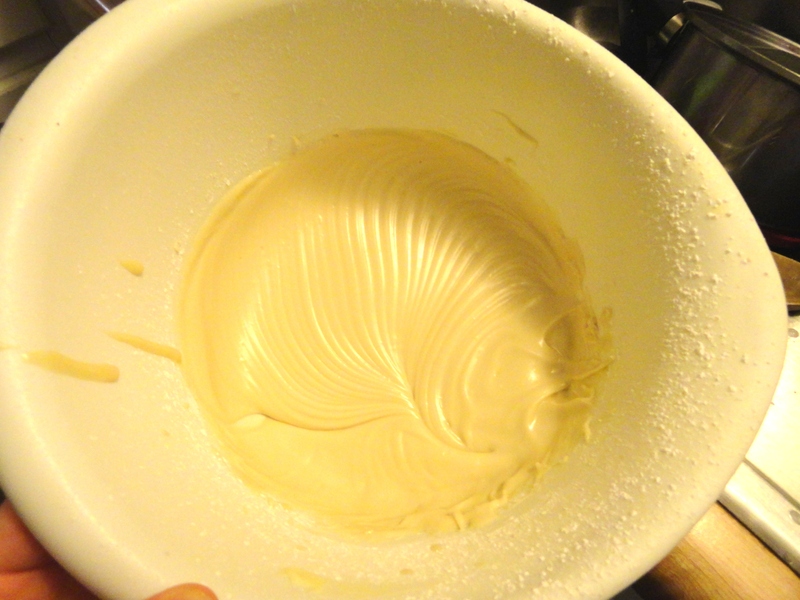 Put the cream into the freezer for a few minutes so it will harden. While that is happening, break the chocolate bar up, place into a bowl, and microwave for 20 second intervals. Stir the chocolate each time after it is heated, and continue until completely melted. Hopefully by this time the cream has firmed up. 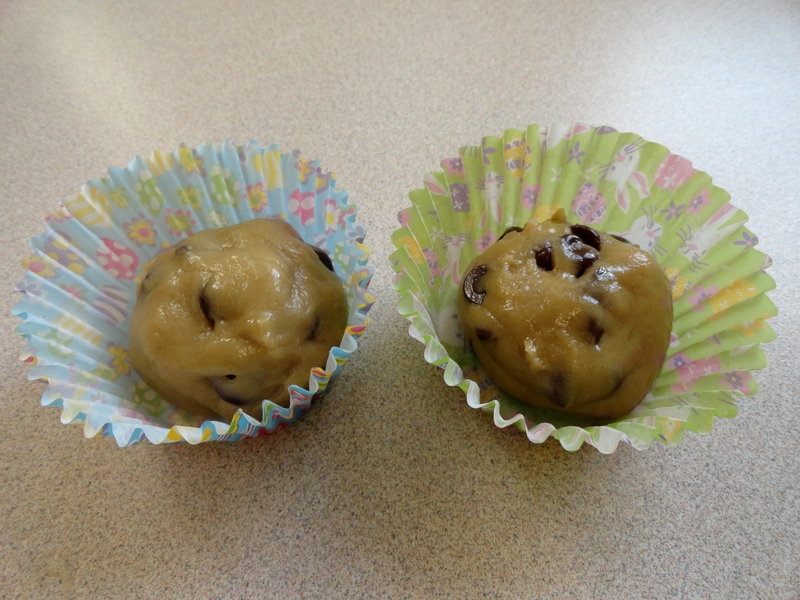 If so, take the mixture and roll it into a several small balls (or whatever your preferred shape is). Quickly dunk the balls, one at a time, into the melted chocolate, being sure to coat the entire thing. 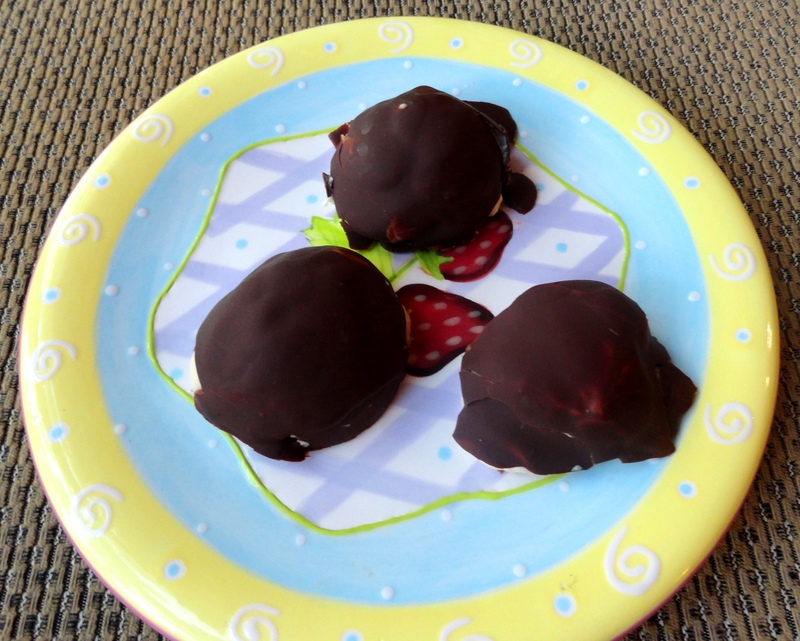 Once coated, place them onto a plate with wax paper, then back into the fridge. Once the chocolate dries, you’re ready to eat them! 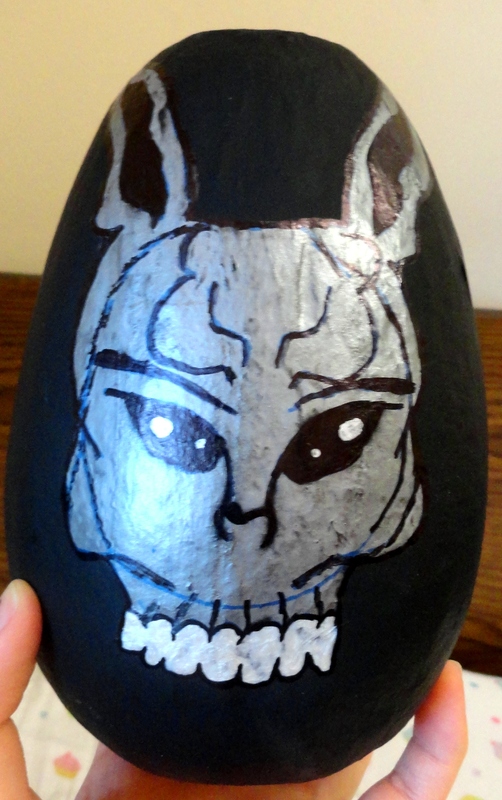 Also, so as to not miss out on the tradition of dyeing eggs, I bought some chicken-friendly paper mache eggs at Hobby Lobby. 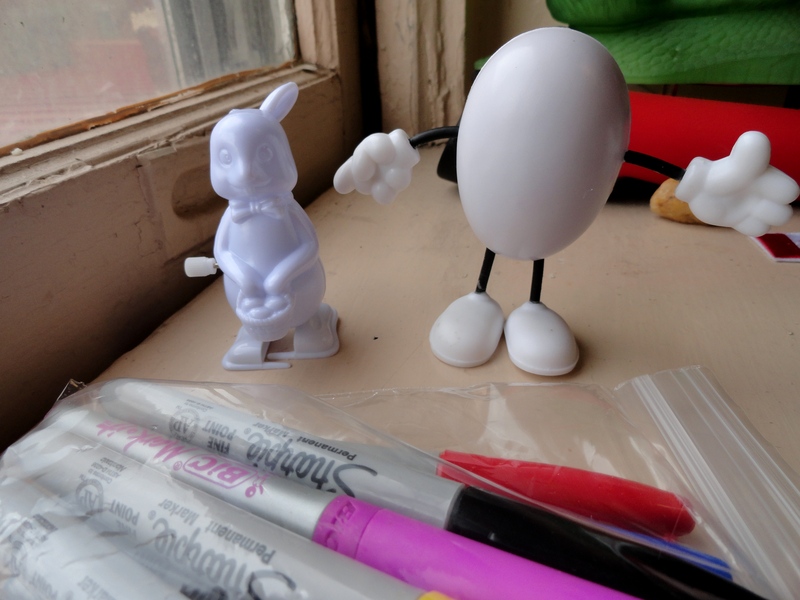 I made some boring pastel colored small eggs, but I also got a giant egg and painted Frank on it, who is from the cult-classic movie Donnie Darko. I followed an online drawing tutorial to get his face drawn right (though his teeth are still a bit too bucky). I have been on a blogging break for spring break, but it’s time to start back now that school begins tomorrow morning. I ate a lot of good food over the break and now it’s time to share pictures of all my noms. Right before leaving for the break, the cafeteria actually made a nice vegan lunch. 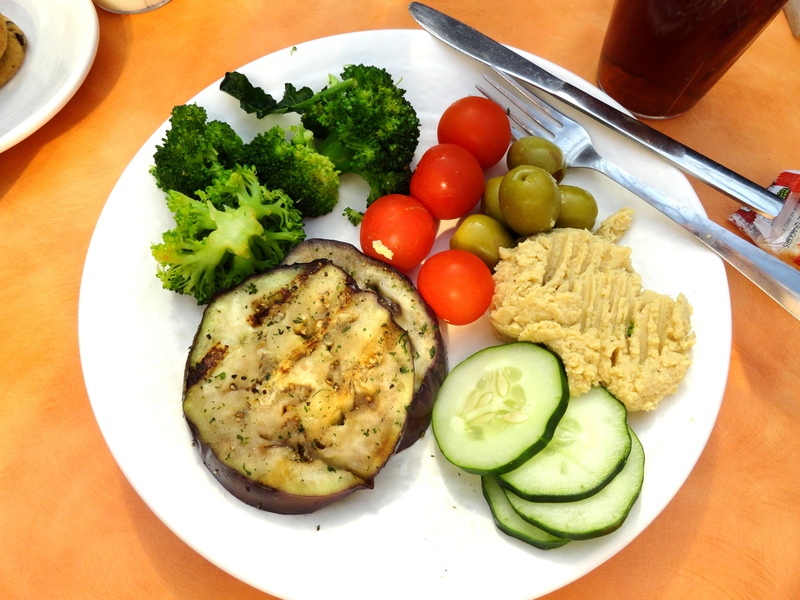 They had grilled eggplant “steak”, steamed broccoli, and spicy hummus paired with some tomatoes, olives, and cucumber slices from the salad bar. My boyfriend, Peter, and I went to Arkansas last weekend to visit my mom, so we got the pleasure of not having to cook and let her be the one to feed us. 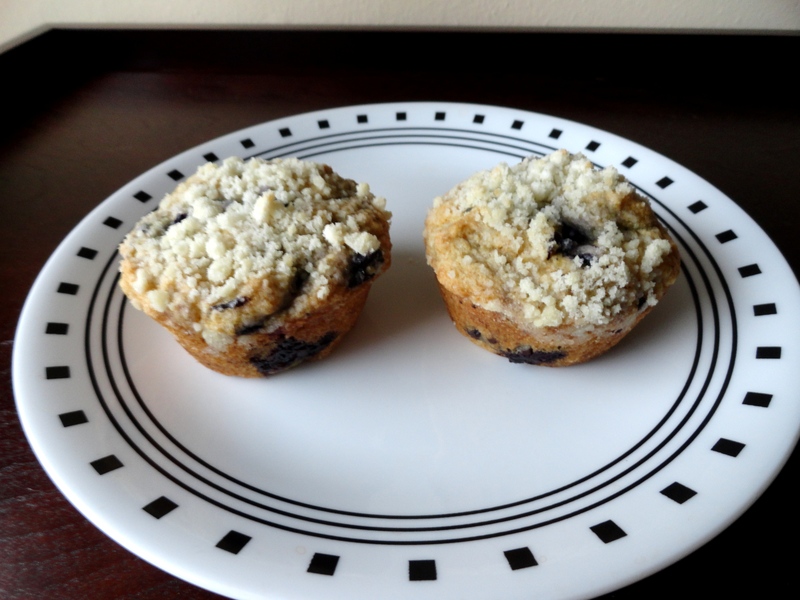 She made some great blueberry muffins with streusel topping for breakfast. 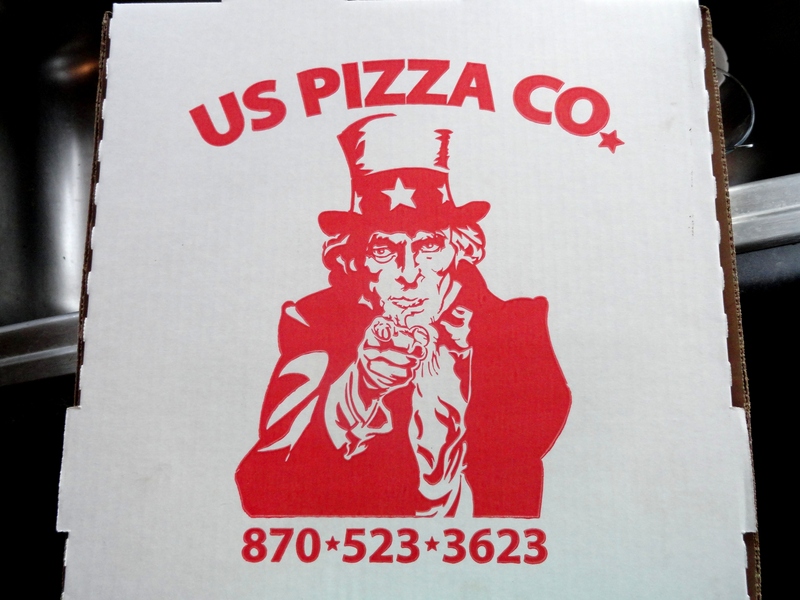 Not everything was homemade though, we did get us some pizza from the US Pizza Co.
We got the veggie-lovers pizza. Though I had to eat mine cheese-less because I had no Daiya on hand, it was still really good. 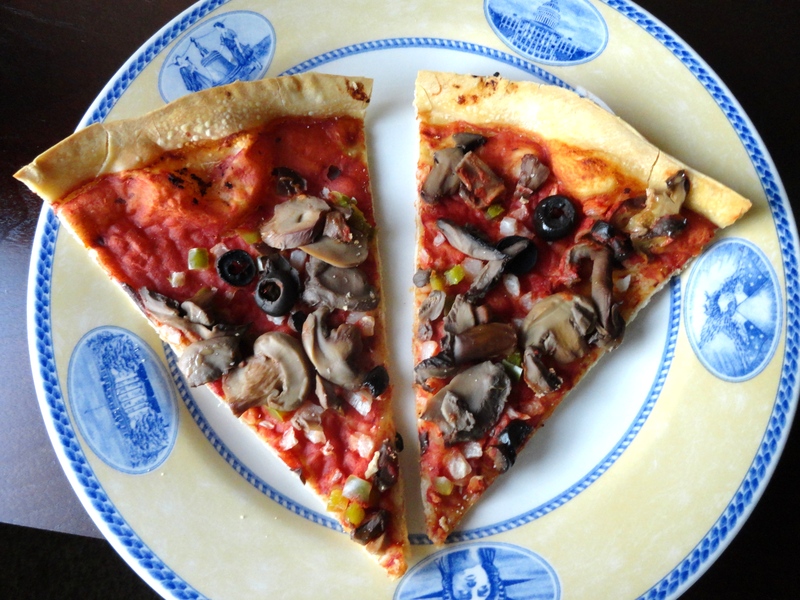 The thin crust gets super crispy and they use canned mushrooms which gives it a meatier texture. Yum. Once back home in Alabama, I thoroughly enjoyed having my own kitchen to cook in. I am still not used to the icky public kitchens in the dorms. For lunch I cooked up some frozen hash-browns with spicy seasoning, a bit of salsa, and a ton of Daiya cheddar. 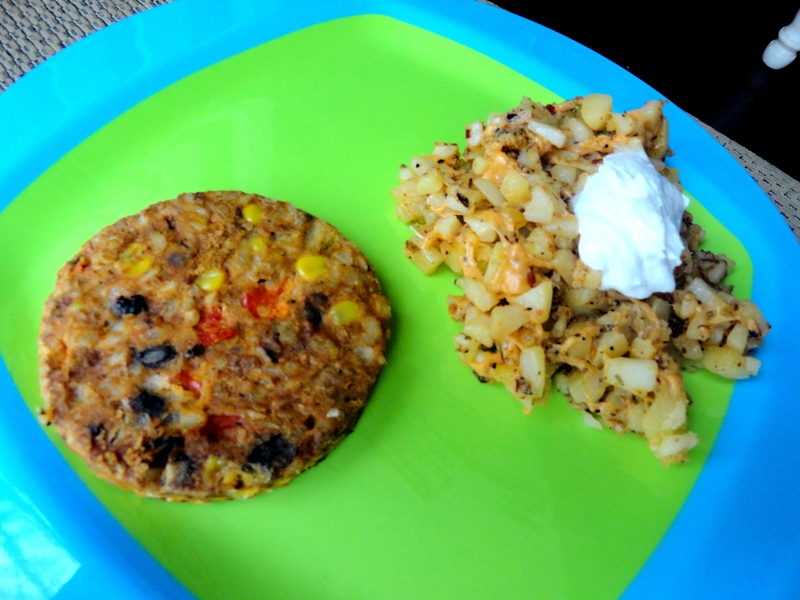 I topped the hash-browns with Tofutti sour cream and added a Garden Burger black bean patty on the side. 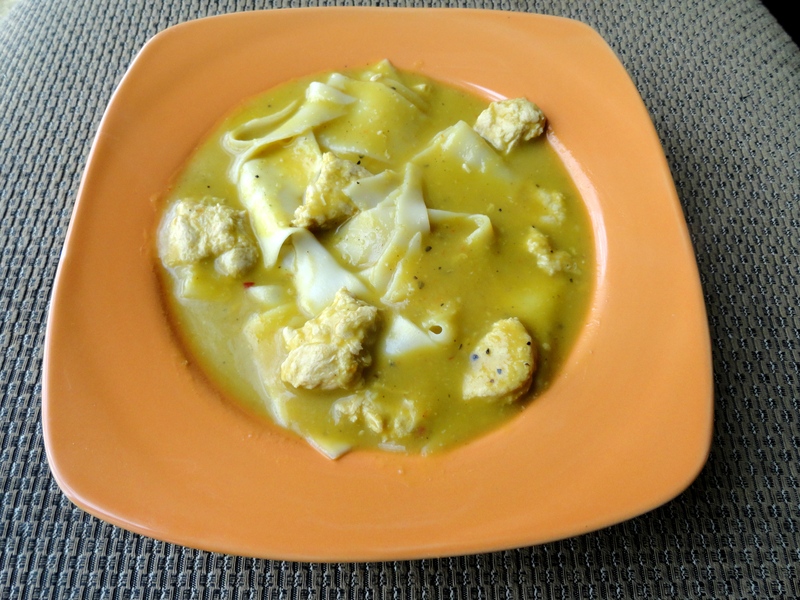 Those ingredients turned into one of the best dishes I have ever made, chick’n and dumplings. 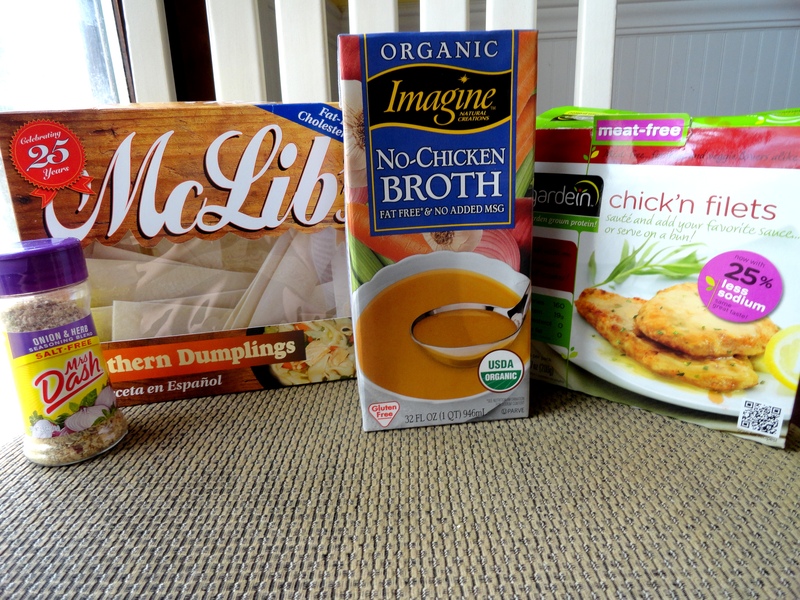 I brought about half of the container of Imagine No-Chicken Broth to a boil, stirred in a vigorous dose of Mrs. Dash, added the chopped up Gardein chick’n, and lastly threw in the pre-made dumplings to cook. All in all, this meal took at most 15 minutes to make, and it was delicious. 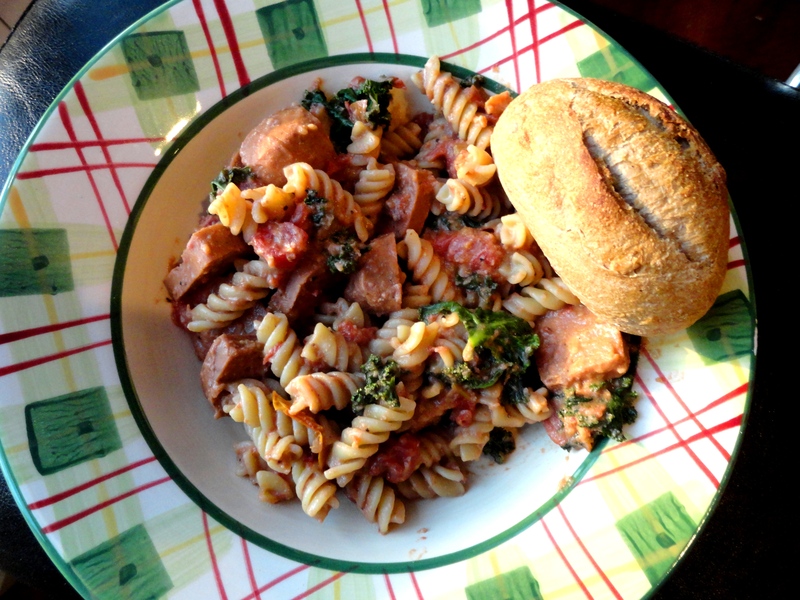 Another experimental dish that turned into a keeper was this creamy pasta with sausage. I threw some spiral pasta in to cook and then began making a sauce. I added a can of diced Italian tomatoes, two big handfuls of chopped kale, a dollop of Tofutti sour cream, a healthy dose of Parma vegan parmesan, and some chopped of Yves Italian sausages. The sauce simmered for about ten minutes while the pasta cooked, then I threw it all together in a pot. I served it with a whole-wheat Alexandria’s roll on the side. This was delicious and my sister and her boyfriend (who are sometimes known to be picky around vegetable filled foods) sucked down all the leftovers with their compliments to the chef. 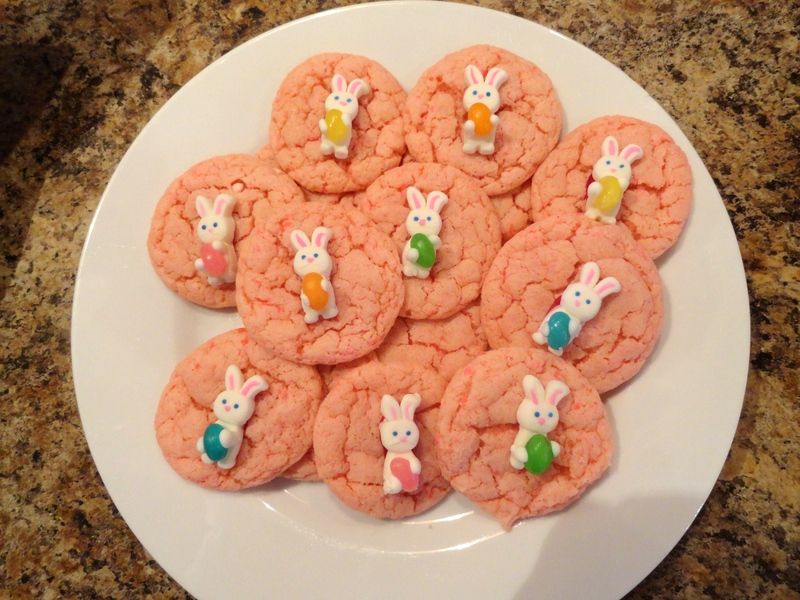 I know Easter is still two weeks from now, but I couldn’t resist making these cute cookies. They were pink lemonade flavored, and they were *gasp* from a box mix. 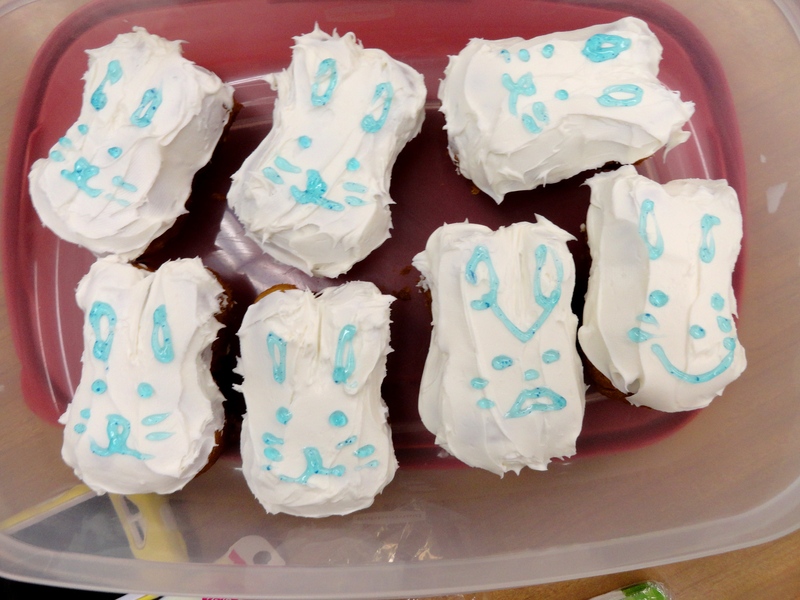 The cookies tasted great though, but the bunnies were an issue. I found the adorable Easter decorations at Walmart and since the box said “edible” on it, I assumed it was true. These sugar bunnies could literally chip your tooth if you tried to chew on one, they were like rocks. Everyone enjoyed the cookies though and just pulled off the decoration. Every Thanksgiving and Christmas, our house is filled with a wonderful scent. It’s from the chicken and sage dressing my mom always makes us. 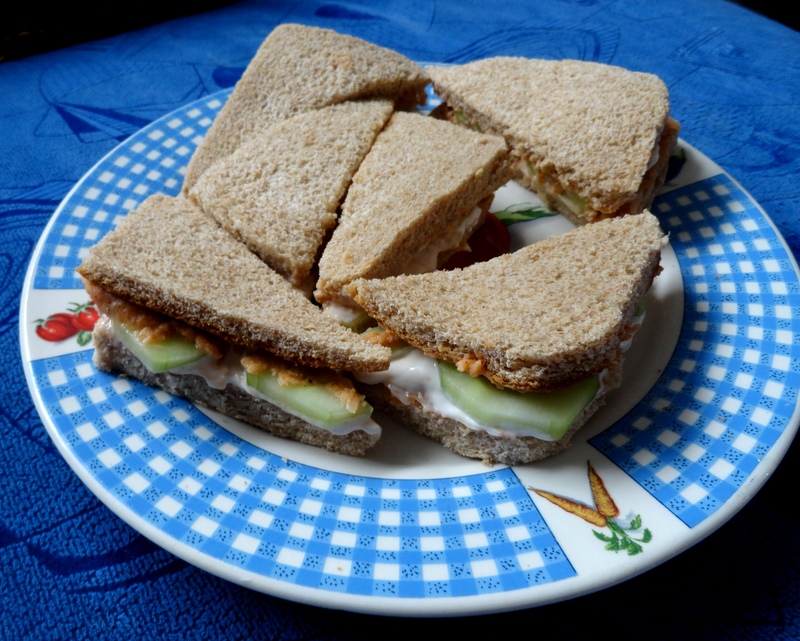 Her mother made it for her, she made it for me and my sister, and now I’m veganizing it. 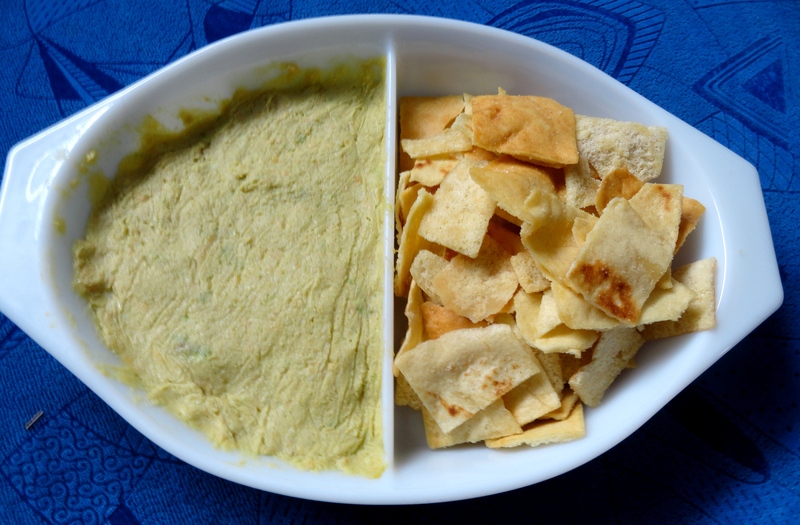 I wasn’t too sure how the recipe would turn out, because I was struggling to figure out how to replace two cans of Campbell’s cream of celery soup and one small can of condensed milk. 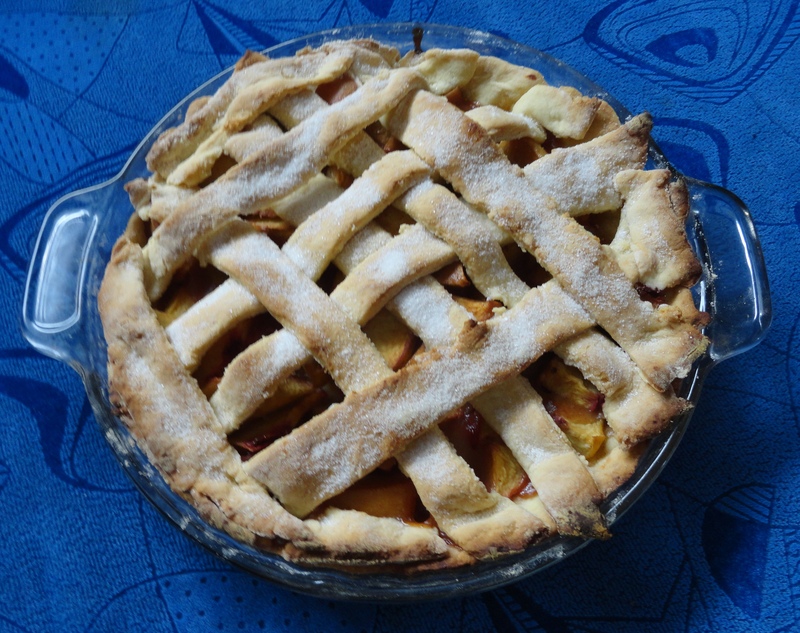 After some trial and error, I finally came up with this recipe. It tastes exactly the same as my mom’s, and it makes the house smell just as nice as before. Sorry for the crappy picture, it was taken with no natural light available. 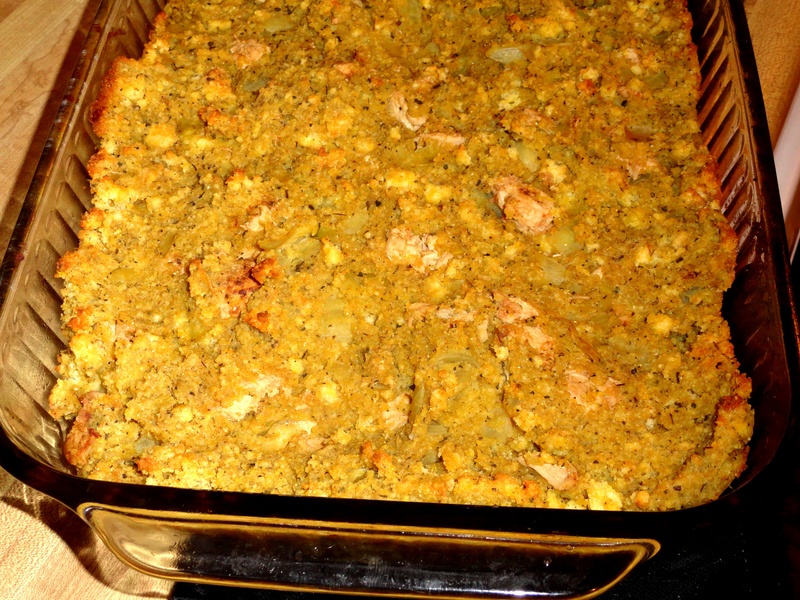 If you have not already, bake the cornbread, then cook and chop the faux chicken. Set both aside for now. Finely chop the onion. Melt the margarine in a large saucepan and add in the onions. Saute until the onions become translucent, stir in the flour until it forms a thick paste, then slowly whisk in the soymilk and vegetable broth. Once the sauce has thickened, remove from the heat and stir in the nutritional yeast, rubbed sage, salt, and pepper. In a large bowl, crumble the cooked cornbread, then pour in the sage sauce. Stir until everything is well combined and there are no dry pockets of cornbread left. Then add in the chopped chicken and mix thoroughly. Pour into 9 x 12 glass baking dish and bake for 40-55 minutes. The way to tell if it’s done is when the bottom is a golden brown, and the top looks well baked. As I told in my last post, I left my camera cord back in my dorm room in Montevallo. We have finally made it back to campus today, and I immediately began downloading the photos. Unfortunately I did not make a lot of food over the break that was “picture worthy”, but a few did manage to meet my criteria. Plus I came up with a new recipe I will be posting later. 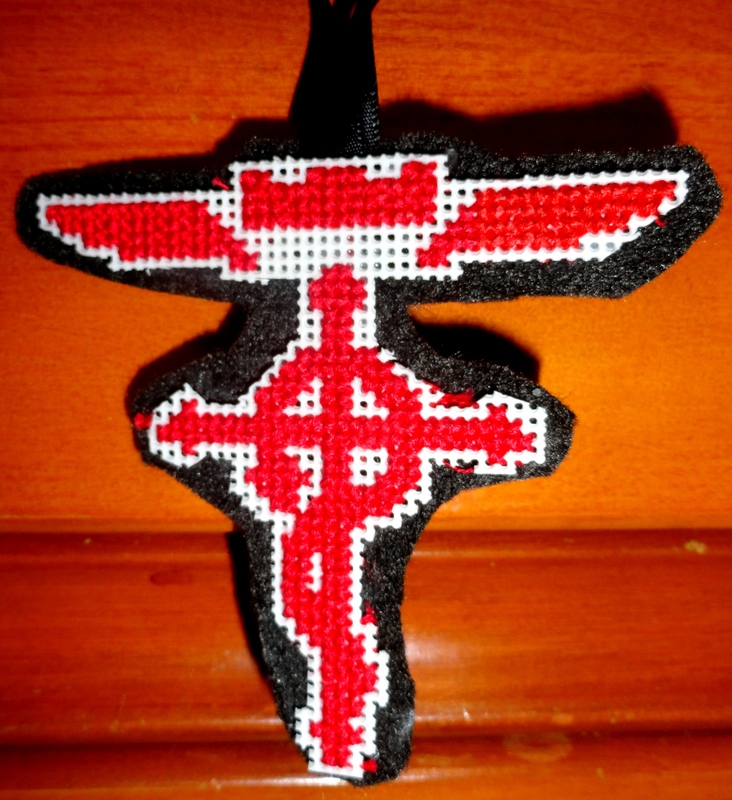 Much crafting was done, and the majority will be in a different post, but I’ll include one here. Before leaving for school, I had $70 worth of “flex points” left to spend. 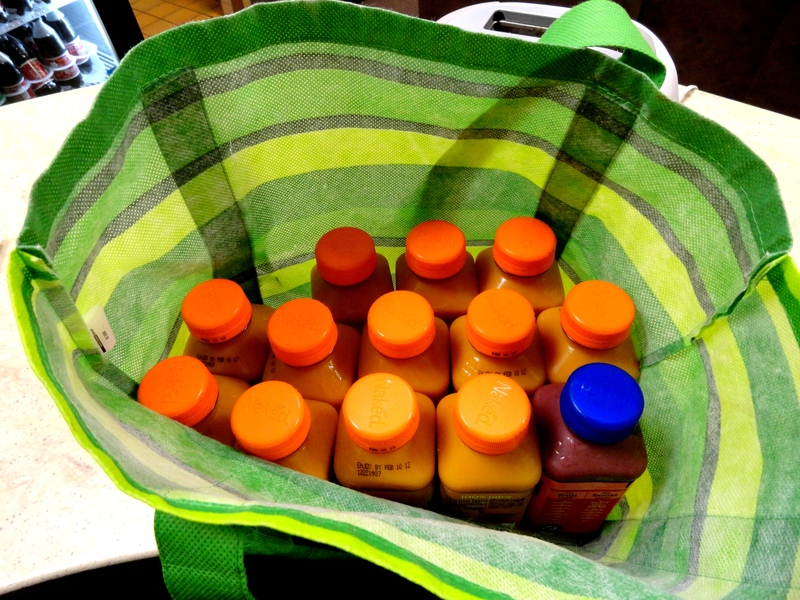 So I bought (for me and all my friends) several orders of fries, a couple of sodas, and 13 Naked juices, which are pictured below. Inspired by seeing a delicious looking post on the Post Punk Kitchen, I made tater tot nachos. Soooo good. 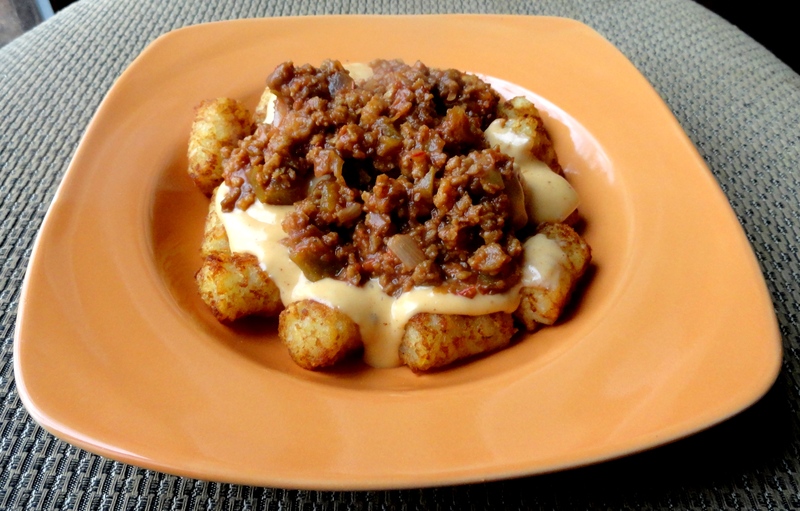 It was tater tots, topped with a nacho cheez sauce made with Daiya, and Yves crumbles with salsa. I could eat this every day. 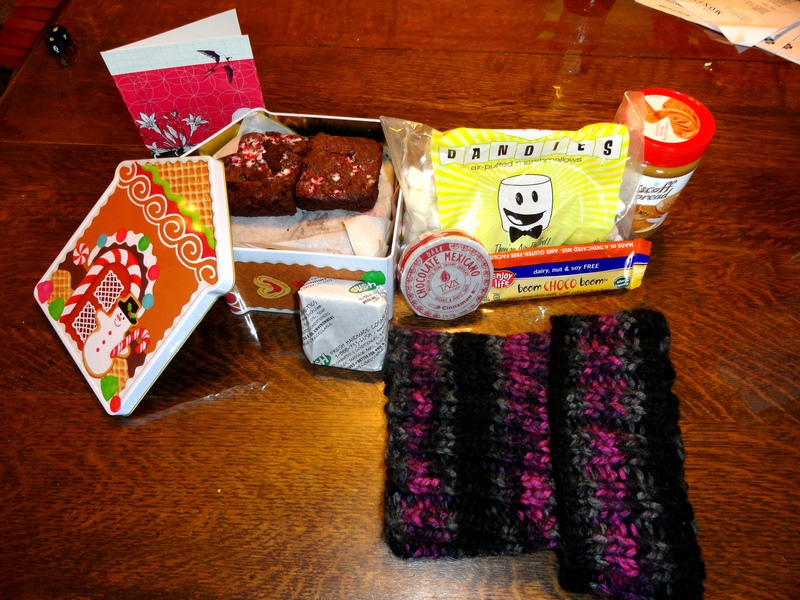 From left to right: a bird card (with an awesome elephant drawing inside), homemade chocolate peppermint brownies in an adorable tin, Lush soap, Dandies vanilla marshmallows (! ), Mexican cinnamon hot chocolate, a super warm and fluffy knitted cowl, an Enjoy Life rice and dark chocolate bar, and Biscoff spread. I am so excited to try all the things in the package. I already tried the brownies and they were super yummy, and the marshmallows too, which was amazing because I haven’t had marshmallows in four years! 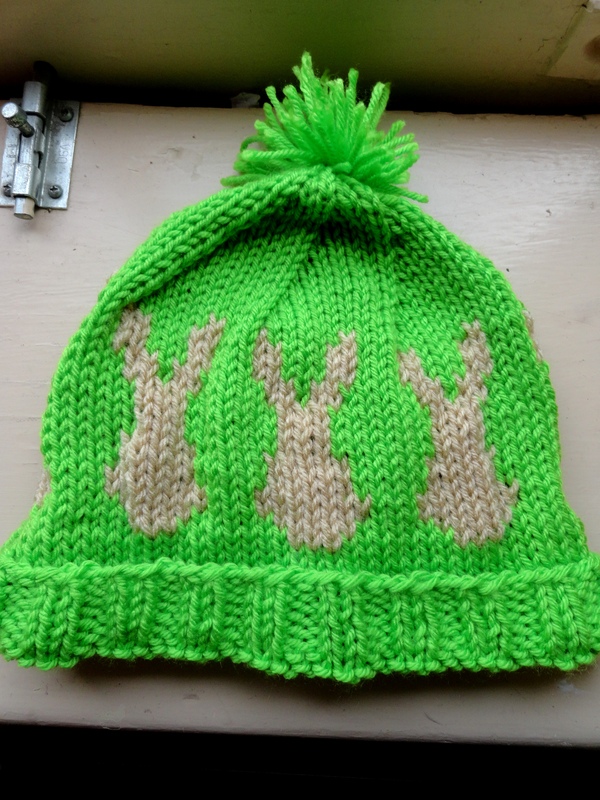 This year I vowed to do entirely homemade Christmas gifts, so I spent the majority of December crafting. 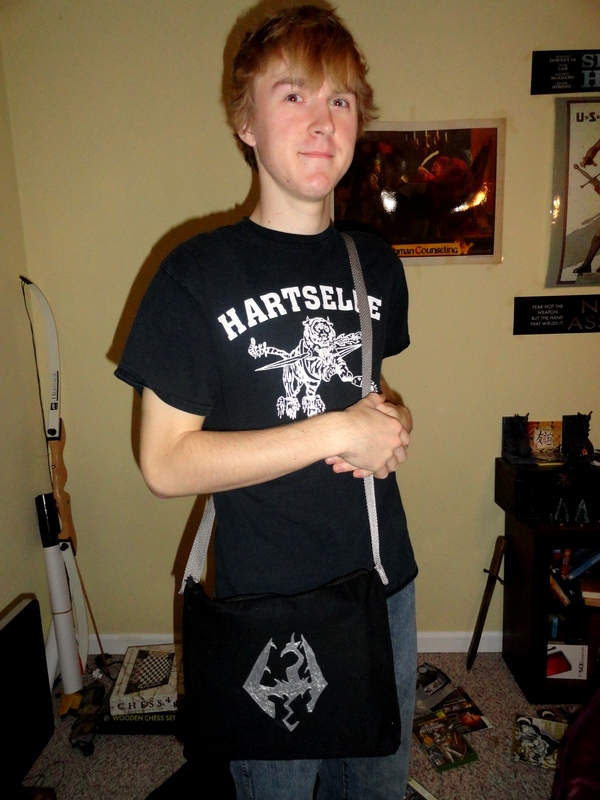 I didn’t get pictures of all the gifts, but I did include pictures of two special ones. Other than the two below, I made: a pair of fuzzy slippers, Slytherin scarf, Tri-Force pillow, frilly apron, a grapefruit ornament, hedgehog pin cushion, a coffee mug with a mustache painted onto the bottom (to make the wearer look mustachioed when drinking), and a Skyrim ornament. 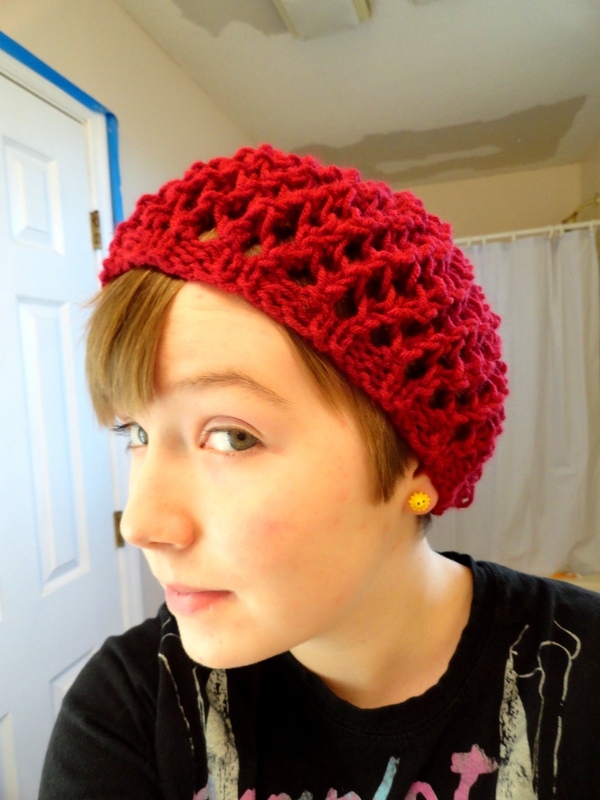 I also got around to some knitting and made a slouchy hat for myself from this pattern over at White Girl Knits. I had a great Christmas and happy New Year, and I hope everyone else did too!